We have been successfully partnering with Skills Training UK on our South Eastern Local Enterprise Partnership and European Social Funding (ESF) Basic Skills contract for over a year now. 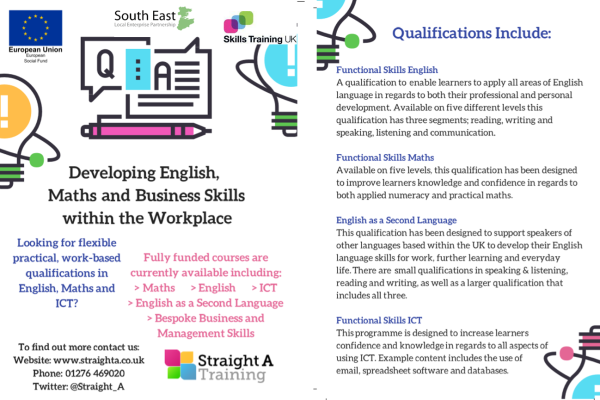 Offering funded qualifications in Essex and Kent, with an initial focus on English, maths and ICT to levels 1 and 2, we have engaged with employers and self-employed learners to help participants gain accredited qualifications and progress them onto higher levels, Apprenticeships and even bespoke Team Leading units. The project is still running and we have capacity and funding for more learners, so please get in touch if this is of interest.